Thursday morning. Up early per usual, so it seemed like a good day to visit Doi Suthep. Ak, my new Thai friend in Bangkok, had recently been in Chiang Mai and he recommended getting there first thing in order to avoid the crowds and the heat. Sounded like a good plan to me – now, how am I going to make it up the hill to the temple? 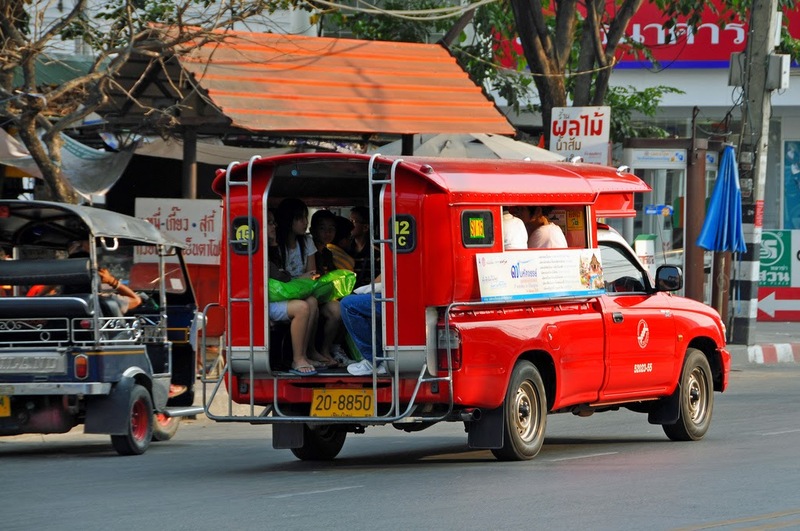 On the one hand, the cheapest (and from all accounts, quite easy albeit only moderately comfortable) way to make the journey is by songthaew, the ubiquitous passenger trucks plying the streets of Chiang Mai. For a mere 50THB, I’d be up the hill and on my way. On the other, I am 51-goddamn-years-old with a reasonably well-paying job and a taste for the easiest, most comfortable options when traveling. Thus, off I went to the concierge to arrange for a driver to take me there and back. So much for authenticity. Speaking of “authenticity” (I only use the scare quotes once, but consider them there whenever I use the term), let me digress for a moment. I am enjoying my time Thailand in immensely – not least of all the food. And thanks in large part to travel and food celebrities like Anthony Bourdain (in particular), there is an idea that if one is not seeking out the most unusual, the most off-the-beaten-path, the most daunting-to-western-palates-and-likeliest-to-result-in-GI-distress foods and restaurants, one is merely a dumb tourist, rather than a world traveler. Yes, I’m overstating things a bit, but it’s certainly difficult at times for me to not feel somehow guilty when I decide to have lunch two days in a row at the same tasty but tourist-centric restaurant in the middle of Old Town. Or, as in the case of visiting Doi Suthep, choosing the relative luxury (despite an extraordinarily reasonable price) of having a driver shuttle me to my destinations. Though when I think about it, those who worship Mr. Bourdain (I don’t bear him any specific ill-will, but am also not a particular fan) and seek out his recommendations wherever they go are their own different brand of inauthentic, given that they are following a path blazed by a rich and famous celebrity with a retinue of assistants, camera people and researchers. During my food tour on Monday night, the other folks were kvelling over Cowboy Hat Lady, made famous thanks largely to Mr. Bourdain, and clamoring for photos with her. Sure, her pork knuckle was really tasty – there were dozens of other food carts within a stone’s throw, but hers was the “one,” the box ticked on that experience. Of course, to be fair, it is this quest for authenticity that has pushed me out of my comfort zone. Some of the places I’ve eaten and will be writing about required a bit of a push for me to just go ahead and eat. Honestly, I’m not so much concerned about food poisoning in and of itself – Zeus knows I’ve had it more than once in the U.S., sometimes even self-inflicted – it’s more that I’m worried about it kicking in when I’ve got a planned excursion or, worse yet, an airplane flight. And thus far, I’ve had no issues and I’ve enjoyed some really great food I might not have tried otherwise. I suppose ultimately though, the very idea of authenticity is inauthentic. I may be a stranger in Thailand, but I am a following a path not dissimilar from hundreds of millions of visitors to this country throughout its history. And so far, just about every experience I’ve had, from observing monk’s chanting at Wat Chedi Luang to eating Northern Thai curry at a trendy restaurant in which I was the only farang to being chaffeured out to the countryside with a bunch of other westerners to mingle with elephants, has been pretty great. Anyway, sorry to ramble. Really, this is all just a reflection of my own rather deep-seated insecurity in most everything I do – and traveling solo probably gives me more time to reflect on it than is necessarily healthy. So, yeah, the point is I paid $35 to have a driver, Buhm, at my beck-and-call for my trip to Doi Suthep and I’m (kind of) OK with that. Wat Phra That Doi Suthep was lovely. Situated atop a hill (Doi Suthep is actually the name of the hill, though it is commonly used to refer to the temple as well) overlooking Chiang Mai, reached by climbing 304 steps up a staircase with dragons on either side. It’s a smallish wat, but with an especially impressive collection of Buddhas and a soothing atmosphere (at least when not surrounded by yammering tourists). I was glad to have made an early start while the place wasn’t too crowded – though a rather large busload of French tourists had arrived moments before me, so it wasn’t exactly a complete oasis of calm. Of course, I did take advantage of my rudimentary French and inquired of one of the group, “Excusez moi, madame. Pouvez-vous prendre un photo de moi avec l’éléphant?” I may not know more than three words of Thai, but I’ll speak whatever non-English language I can given the opportunity! After Doi Suthep, my driver took me a bit further up the hill to Bhubing Palace. While it does indeed include a couple of relatively simple royal dwellings, it is primarily open to the public to visit the lovely gardens. Roses and orchids are the most popular flowers on display and the circular path around the grounds took me about an hour or so to walk. Very quiet, peaceful and sparsely populated – a welcome respite from some of the more hectic activities in town. Buhm was taking me back to the hotel and I asked if he could drop me off at Green Bamboo Massage instead. While the services were adequate, I’d been spoiled so far with therapists who were quite intuitive as to which of my muscles required the most attention. I suspect the fellow at this place gives everyone the same massage. Not awful mind you, just fairly cookie-cutter in its application. I’ll be honest – at this point I was feeling a bit like I might’ve dedicated too much time to Chiang Mai. Not that I was bored, but I didn’t have a lot on my agenda until Sunday. Of course, this is one of the realities of solo travel. There were actually a couple of tours I was interested in taking – but they require a minimum number of participants, so I had to keep my fingers crossed that there’d be a group I could fifth-wheel with. Sadly, no dice for hiking or biking in Doi Inthanon or a different bike ride in the countryside. So, I did what any reasonable person would do – I bought myself a coconut ice cream (served with fresh coconut, sticky rice and mung beans) and made an appointment for additional spa services the next day and all was right with the world. Dinner that night was found via TripAdvisor at a place called Lert Ros. Yeah, I know – while generally helpful for hotels and tours, it’s frankly the worst when it comes to finding good restaurants. I suppose this is simply a reflection of the fact that rankings are driven by user reviews and most people have terrible taste in food (unlike mine, which is perfect). But one place high in the ratings was a quite humble looking Thai place specializing in grilled fish – so off I went! Found it easily enough – and then convinced myself it was a bit too dodgy looking and kept walking. Then I said myself, “Self, don’t be ridiculous. You traveled all this way, don’t be such a scaredy cat!” So back I went, got a table and had an super delicious salt-crusted, freshly-grilled whole tilapia. It was great! I also had some larb moo, which was just OK. But I enjoyed my meal and was happy that I didn’t chicken out. A nice walk home, a couple of beers in my hotel room and off to bed. Tomorrow: MOAR SPA TREATMENTS. LITERALLY stopping to smell the roses!